Alessandro Serra became acquainted with theatre at a very young age by adapting the cinematographic works of Ingmar Bergman for theatrical representations and the practice of Martial Arts. His acting studies began firstly through Grotowski’s physical action and vocal vibrations, to later study the objective laws of corporeal movement on stage as conceived by Mejerchol’d and Decroux. Alessandro graduated in Theatre Studies at the University La Sapienza in Rome with a thesis on the dramaturgy of the image. 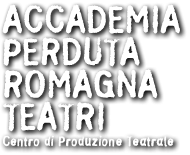 In 1999, he founded the Acting Company Teatropersona with which he began to stage his theatre works, directing and writing them, creating the scenery sets, the costumes and directing the lighting. In recent years his research on the stage being an essential matter-related component has developed into the creation of a “trilogy of silence”, where dramaturgy is practised as a true “explanation of atmospheres” from literary works by Samuel Beckett, Bruno Schulz and Marcel Proust. In 2009, Alessandro created his first work for children, Il Principe Mezzanotte (Prince Midnight), performed in more than two hundred representations in Italy and abroad. Teatropersona has toured it’s repertoire in Italy, France, Switzerland, Korea, Russia and Polony. In 2015, Alessandro authored and directed H+G, co-produced with AccademiaPerduta/Romagna Teatri and Accademia Arte della Diversità/Teatro La Ribalta, with Compagnia Teatropersona, he also won the Eolo award as “best new work for children and young people’s theatre”. Amongst his creations are: Nella città di K (2000), Cechov non ha dimenticato (2003), Theresienstadt (2005), Beckett Box (2006, European Award Beckett & Puppet), Il Principe Mezzanotte (2009, Award by the Critical Students Observatory at Premio Scenario Infanzia), Trattato dei manichini (2009, ETI Award Nuove Creatività; Lia Lapini Award for stage writing), Aure (2011), Il Grande Viaggio (2013, The Audience Award at the FIT Festival in Lugano).